Powerful Light, Compact Form. The Litepanels MicroPro On-Camera LED provides soft, daylight-balanced 5600K light, yet weighs just over half a pound. Its built-in dimmer lets you adjust the light output from 100-0%. Power Options. It draws 9 watts of power from 6 AA batteries (not included) and can also be powered by a 5-12 VDC source (also not included) via its input jack. Mounting Options. There’s 1/4"-20 threading on the light itself, and we include the tilting hot shoe adapter for mounting directly to camera hot shoe. If you want to mount this light to a light stand, you’ll also need to rent the Hot Shoe to Light Stand Adapter. Comparison. Most people want to know about the amount of light the various shoe-mount lights put out, since the manufacturers seem to go to great lengths to avoid direct comparison. 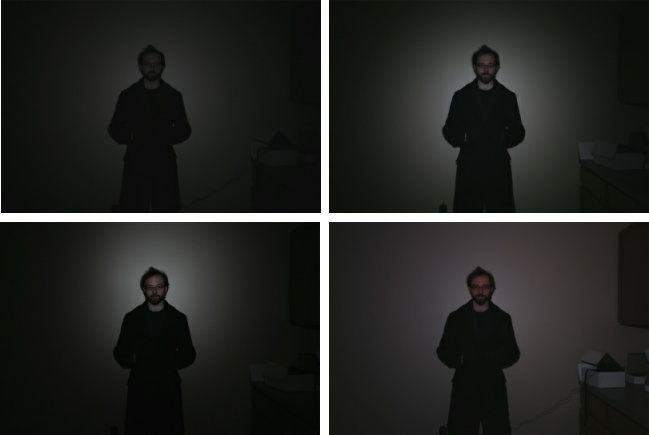 We shot identical images with each light, which you can see below. Note that the room was completely dark except for the light, the distance was 11 feet (longer than they’re designed for), and that the camera was set to underexpose the images to clearly show the width of the light beam. The lights are all better than this; the shots are for comparison purposes only. The weakest light is the Litepanels Micro. It’s good for fill light, but couldn’t be your sole light source in a dark room, even for an interview situation. The Bescor is brighter than the Micro, has built-in barn door modifiers, and comes with a heavy-duty battery, so it’s great for field work when you want a tight beam—say to light just an interview on camera. The Zylight and Litepanels MicroPro are about equal in total light output, although the MicroPro has more of a spotlight effect while the Zylight is a bit broader and softer. Does this rental include tungsten warming filters and a diffuser? This rental doesn’t include include tungsten warming filters and a diffuser. If you’d like them, please request them in the Special Instructions box during checkout.